1. My guess is, if you’re wanting to learn Kazakh, it’s because you’re 1) a grad student in search of obscure research, 2) a professor who got a job in Kazakhstan, 3) an aid worker or teacher, 5) a diplomat, in which case you already have expert help, 6) someone who got married to a Kazakh, 7) a trailing spouse, who got married to someone who ended up in Kazakhstan, 8) a tourist, or 9) insanely good at and fascinated with languages. Питтсбург қаласындағы «Жанжал асханасы» деп аталатын ресторан Куба, Иран, Ауғанстан мен Венесуэланың ұлттық тағамдарын пісіріп, бұл елдерді жаңа қырынан танытқысы келеді. Pittsburg qalasyndagy <Janjal askanasy> dep atalatyn restoran Kuba, Iran, Aughanstan, men Venesuelanyn ulttyq tagamdaryn pisirip, bul elderdi jana qyrynan tanytqysy keledi. Pittsburgh city-at “conflict cafe” said named-was restaurant Cuba, Iran, Afghanistan, and Venezuela’s national foods-to cook, this countries-to new side-from introduce-to is wanting. Pittsburgh’s “Conflict Kitchen” restaurant fixes national foods from Cuba, Iran, Afghanistan, and Venezuela, introducing a new side of these countries. Besides how amazing this food sounds, my point is: look at all those word bits! More or less, red = belonging; purple = where it’s at/from, orange = adjectives, light blue = passive, active, or reflexive, green = verb tenses, gray = plurals, dark blue = accusative or genitive cases. And often you can see two or three endings on a single word. Beautiful. I love Kazakh for this reason – not just because the base words are great (above, pisiru = to cook, janjal = conflict, qala = city, tagam = food, jana = new), but because adding all the endings and watching how they interact is like studying a puzzle. 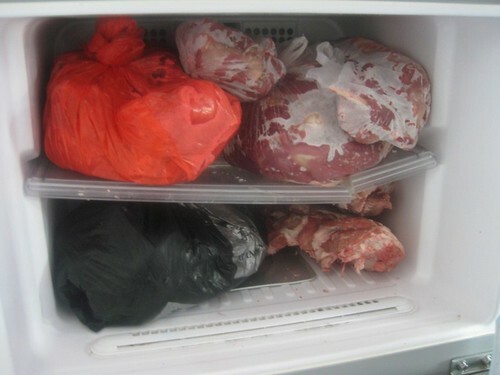 Lacking Afghan food, I’ll just go straight for a Kazakh freezer… meat! First, learn your alphabet. Kazakh may change to the latin alphabet in the future, but as of now, it’s still in Cyrillic. Download the alphabet PDF from Indiana University, and then Niki Dutta’s great list of the 500 most essential words in Kazakh, Russian and English. If you actually plan to live in Kazakhstan, it wouldn’t hurt learn both Kazakh and Russian. Next, try puzzling through some posts at the new Kazakh Language blog. Not sure where this blog popped up from, but it’s got song and story translations, carefully broken down for the English-origin language learner. For instance, this post takes a Youtube vid of Dinara Sultan’s song Sen (“You”) and adds the lyrics in Cyrillic and Latin letters, then the English meaning, and then a breakdown of what each word means. Not a bad way to learn! If you’re really interested, look for a tutor. Perhaps there are Kazakhs in your city on study or business. But if not, sharedtalk.com offers free language exchange. There are always young Kazakhs looking topractice their English, and they’ll be delighted to teach you some Kazakh in return! Message until you find someone you like, and then you can try Skyping for more audio practice. If you’re serious, classes are very helpful. In Kazakhstan, try KIMEP in Almaty or the Eurasian National University in Astana. A handful of American universities also teach Kazakh, including U Wisconsin, U Michigan, Indiana U, U Washington, and UT Austin. Indiana University has a strong summer program in the US, and American Councils puts you right in Kazakhstan for a summer. It will run a few thousand dollars, but you can often get full scholarships if you’re a grad student, or planning to start grad school soon. The classic textbooks in English are the 2009 Kazakh Language Manual from the Peace Corps, edited by Michael Hancock (find the 1995 version freely here), and the green Kazakh Language Made Easy, by Iraida Kubaeva. However, both are somewhat hard to locate outside of Kazakhstan. University of Arizona sells CD lessons at three levels. Radio Free Europe’s Azattyq.org is good for listening to news, and Youtube has music videos. 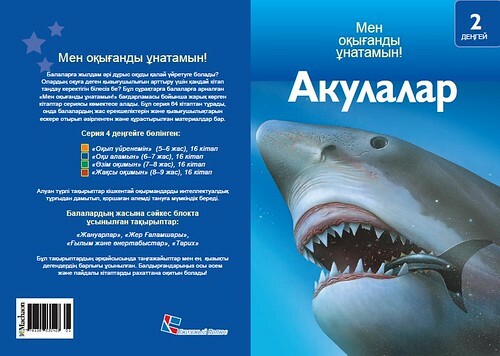 More and more publishers are starting to add Kazakh to their language series, with varying results. Try Colloquial Kazakh by Zaure Batayeva, or download audio flashcards from BYKI online or via iPhone. Search “Kazakh” on FlashcardExchange to find my many free flashcard sets, and then pull them into Flashcards Deluxe Android / Apple app for practice while you’re waiting in the airport. This has worked great for my vocab, but I’m now open to suggestions on how to improve my grammar! Once you’ve started, Kazakhstan’s online libraries kitap.kz and adebiportal.kz have free ebooks in Kazakh. An “I love reading!” series offers easy readers translated from English — with such culturally-relevant (?) tales such as Sharks, Ships, Musical Instruments, and Vikings. [Updated link: you can find many of them here: http://adebiportal.kz/kz/authors/book/1185]. What if you need to translate some reading materials? You can find phrase lists and scans of print dictionaries online, and those are great for set words and phrases. But they’re less useful for sorting out colloquial wording. 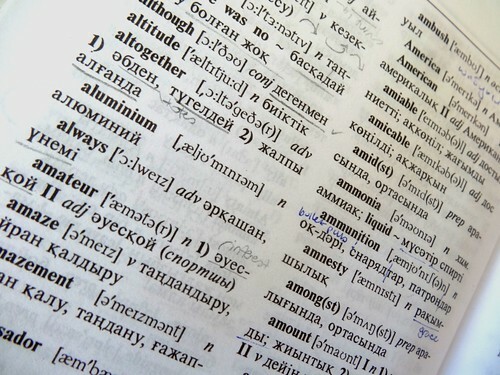 The online dictionary above gives only one English word for each Kazakh one one. So my personal strategy is to enter Kazakh words into the http://sozdik.kz/ dictionary and then copy the long list of meanings and sample uses in Russian. I then paste into Google Translate so that all the Russian flips to English. A terrible method for exact translation, but it gives the most comprehensive sense of difficult or complex words. Another great resource for mid-level learners is Akmaral Mukan’s $70 Learner’s Dictionary of Kazakh Idioms. I’ve been begging for this for ages, but my Kazakh teacher-friend are often more focused on getting locals fluent in Kazakh before training foreigners! But luckily for us, Mukan has lived in America but spent years collecting and testing idiomatic phrases and example sentences in Kazakh, then translating for the English learner. If you’re serious about Kazakh, this is a great book to use for digging deeper. Well, it’s not available yet, but I dream of someday getting paid to work with local linguists on building roots lists as well as frequency lists for learning Kazakh. I tried starting my own roots list a little while ago, but I’d like to see a detailed database with Kazakh-English words, searchable by presumed root, synonyms, type of word, commonality, and topic. Ideally you could query and then download personalized word lists for study. If anyone’s working on this, let me know! And for more about what’s possible with online dictionaries today, watch lexicographer (dictionary-builder) Erin McKean’s TED talk about the possibilities of interactive online dictionaries. She responded personally to my queries about what kind of database programs are best for building an interactive multilingual dictionary, so I think she’s the best (!!! :-D). My only other wish is for more texts on mid- to advanced-level grammatical concepts, as everyone keeps remaking introductory Kazakh-English textbooks in different formats. But once you’ve got the basics, where do you go from there? Hopefully to Kazakhstan, to try out your әдемі (beautiful) қазақ тілі (Kazakh language) skills! Ammonia.. why did I learn the world for ammonia? Very nice research on learning kazakh. I can’t find those simple books that you mentioned. Could you send me a link please? Kitap.kz and adebiportal.kz are good sources for adult readers… and I found these simple books on adebiportal! Try this link for easy children’s books: http://adebiportal.kz/kz/authors/book/1185. Look for the white box saying “Онлайн оқу” to read online. Can I please recommend the Kazakhsha Uireneik course on Memrise? It’s for people that have already studied grammar and are building vocabulary. That looks like a great resource– thank you for sharing!